Ouno Design » Why don’t we have digital textile printing like this in North America? This textile sample was given to me by Andy McDonald, a researcher within the Centre for Advanced Textiles at the Glasgow School of Art. He was at the end of a speaking tour in N. America and had with him this small sample of fabric designed by celebrated Glasgow designers Timorous Beasties. It’s digitally printed, but digital processes have become so advanced that it is becoming very hard to tell digitally printed fabric apart from fabric printed the traditional way. I played with this sample until Andy finally gave it to me. The Centre for Advanced Textiles seems quite far ahead of what we’re doing in North America, both in terms of textile quality and design policy. Through the combination of academic research and commercial services, CAT provides an important link between education and industry and receives substantial R&D support from a forward-thinking, relatively design-industry-friendly state. From the standpoint of the small, independent designer, digital printing is extremely liberating. For example, in its textile printing bureau CAT Digital has a selection of over 30 natural fabrics that can be printed with your design (from a digital file), and because there’s minimal set up, they will print as little as 50cm (20 inches) for you. Perhaps only designers who use textiles will understand how completely thrilling and revolutionary this is – you can design your own fabric in small runs. Among other things this is going to mean a degree of democratization of textile design and the encouragement of smaller local manufacturing. You probably can’t tell from the scan above, but the quality, tooth, weight and drape of the cotton that CAT’s printing system can accommodate is superior to much of what’s available in digital printing in North America right now, and they can print on many different fibres – heavy linen, wool, silk. And you can get fine control over colours; if you look closely in the scan above you can see the subtle grey-on-cream pattern in the background. It’s surprisingly well done, even when compared to traditional printing. And yet it’s not prohibitively more expensive than what most N. American printers are doing on thinner, cheaper cotton. With luck this will change soon, and it seems that First2Print in New York is quickly catching up. It isn’t an economy of scale problem, after all, considering we’re a continent of nearly 350 million. Still, the modern textile industry was born in Scotland, England and Holland, and Europe has long been a fussy, demanding, educated textile market, so maybe it’s not surprising Glasgow has a head start in terms of both innovation and quality. See also CAT’s classic textiles line – classictextiles.com; two samples are below. This entry was posted on Saturday, January 2nd, 2010 at 6:07 pm	and is filed under design, textiles. You can follow any responses to this entry through the RSS 2.0 feed. You can leave a response, or trackback from your own site. You should let us send you a sample of digital printing on our linen-cotton canvas. A few of us in North Carolina are — believe it or not — on the cutting edge of digital textile printing. Yes, please send! I’d love to see them. I was sent your samples last year, and did talk to you about heavier and higher quality cotton, but the samples I was sent at that time were still the much thinner cotton. I’m very excited to see the new fabric – I’ll send my address. Send me an email at the help @ spoonflower address. Let me know where to send the sample. We would love to get your thoughts. By considering [fast] fashion as a form of [mass] media, I feel that as we move towards a post-industrial economy, we should be using technology to revive some of the values of the pre-industrial economy (ie: the Craft movement). Thank you – that’s really useful and informative. As a craftsperson and designer, I obviously agree we need a shift toward craft, quality and production on demand rather than production of surpluses of material in the hope that stock will move. Current mass-production of fashion and household goods is over-homogenized, wasteful, environmentally destructive, and does nothing for local design and craft traditions which are in turn an important part of local cultures and economies. Among many other things. Anyway, you said it all much more succinctly than I have, but in short, these more flexible, responsive technologies do have the potential to alter the terrain for the better. And I’m not usually a technological optimist. Thanks again for taking the time to explain everything and thanks again for the Timorous Beasties sample! I’m making a pillow out of it. a very insightful post by you plus follow up comment by the researcher concerned. ii-ne-kore, I don’t usually manipulatively admire something until the person is forced to give it to me. But in this case I couldn’t help it. And it’s not just me – this thing has been sitting on my desk for about 6 weeks and almost everyone who has come through has picked it up and admired it. The look and feel of it is quite amazing in person. I still haven’t seen another sample that matches the Timorous Beasties one produced at the Centre for Advanced Textiles. 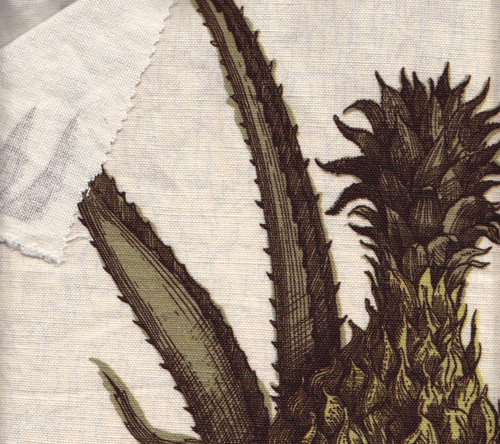 Most digital printing seems to sit on the surface of the fabric in a rubbery way, sort of like an iron-on t-shirt. I haven’t seen a sample from First2Print yet – has anyone? The problem you describe is characteristic of pigment inks whereby the print does literally sit on the surface of the fabric. The advantages are that pigments can be used to print synthetic and natural fibres and the process does not require any finishing. Here in Glasgow, we use reactive inks which actually absorb into the fibres therefore the handle of the fabric is almost identical to its unprinted state. These inks can only be used on natural fibres and must be steamed and washed in order to fix the print. First2Print use reactive inks as well as acid (silks and nylons) and disperse (polyesters) so if the feel of the fabric is important then I would give them a try. I also know that Kent State University will be launching their own print service similar to CAT. Thank you for the mention of First2print. We have been around for over 12 years and have experienced all sorts of questions, problem solving and solutions in the world of digital fabric printing, surface and digital design. I do have to mention, that managing a digital fabric printing business to be profitable is a bit challenging when it comes to trying to R&D materials, inks and equipments within a budget. For the most part, for the digital fabric printing experience to be successful for anyone, effective communication about limitations is a necessity. Just because it is feasible doesn’t mean that a company has to offer it. I believe education and industry suppliers and in some cases, even competition, should be open to discussion in finding ways that digital fabric printing is embraced as a tool for creative expression for printing fabric to make effective product. I also feel that designers (and educators) have yet to grasp the creative opportunities of the medium in the sense that digital tools have simply been used to mimic anolog techniques. Rather than using a Wacom tablet to paint a pretty picture in Photoshop, how many textile designers are actually building their own tools to create truly innovative prints using generative / interactive design methods? Just google Jared Tarbell, Erik Natzke, Joshua Davis or Robert Hodgin to get a sense of the possibilities. For what it’s worth, I recently collaborated with Timorous Beasties and Natasha Marshall on a couple of small research projects that explore some of these themes (you can check out videos here: https://vimeo.com/techstylelab/videos). If you consider how other digital fabrication technologies (3D printing in particular) are being explored, at both the platform level (Ponoko, Shapeways, i.Materialise, etc) and the practitioner level (http://www.labcraft.org.uk has many great examples), I would suggest that innovation in the textile industry is being held back by the inertia of its industrial legacy. In my view, unless ‘textile designers’ learn how to write code, they will once again find themselves relying on intermediaries to translate their designs – just as they did with screen printing. OK, rant over for now! Once again, I think it would be good to talk so feel free to contact me andy@techstylelab.com if you want to discuss things further. PS: Hi Lindsay! Hope you are doing well. I am looking for a digital printer for silks and cottons for a clothing line, preferably based in US, but elsewhere is ok too. The vendors I have currently reached out to in the US are very limited in their scope of both fabrics and finishing techniques. A on demand manufacturer would be ideal. Anybody have any leads for me, I’d be delighted to hear about them. We are small design studio in Brazil looking to expand our operations into interior products and are looking for a vendor in US or elsewhere, that can provide us with high quality printing on good quality cottons. I have just contacted first2print and others, but would be grateful for any recommendations. I too am seeking a supplier for digital textile printing. I wish to work with 100% silk & silk chiffon and have found that die sublimation will not handle the 100% fabrics. I will look into first2print, but would appreciate any other suggestions. Many thanks in advance. Hi BJ, I don’t know. Anyone? I am looking for digital fabric printing services to print yardage primarily of natural fabrics. No polyester. I am based in the U.S.